So what’s your plan? Cards or no cards- for this holiday season? What have you decided? 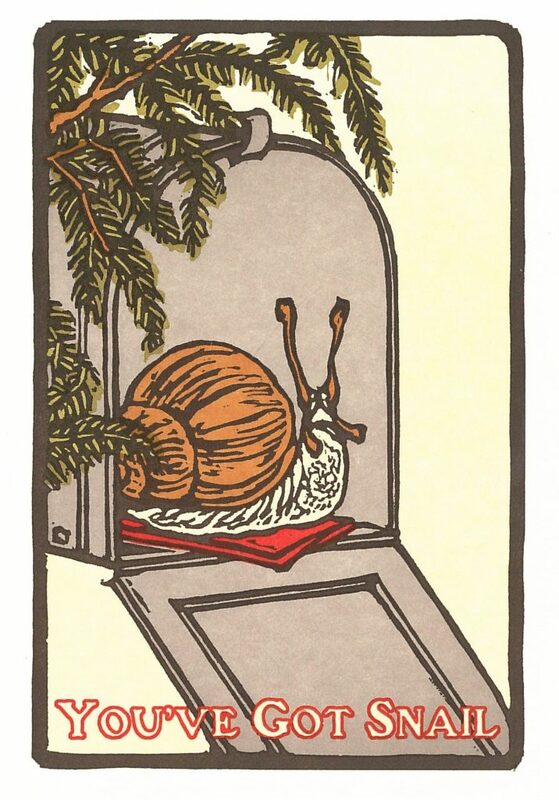 Holiday greetings are all about connecting with people the old fashioned way with snail mail. It could be in the form of a photo card, a commercial greeting card, a handmade craft card, or a family’s annual newsletter. This piece of mail might be the only correspondence you send to someone all year, so it deserves some thought. Snail mail is unique and valuable because it is so rare. People enjoy the novelty of receiving a card in the mail, especially if there’s handwriting on it. Your script alone highlights the personal quality of your message. People feel special. Receiving personal mail makes people happy. The act of preparing the note translates to the receiver as- “I care enough to take time for you alone.” How you word your note or what your penmanship looks like is secondary to the fact that you took the time to write something to a friend. In this fast paced culture, time can often be more valuable than money. Writing a note to someone is definitely, a gift of time. In the Smarter Living article, “We could all use a little snail mail right now,” we are cheerfully reminded why a note in the mail is still the best way to connect. It conveys happiness, strengthens bonds between people, it’s dignified, and just plain good manners. Basically, it’s a keepsake and a piece of personal history. If “Don’t have time” is your holiday mantra, consider getting a perpetual birthday calendar and focus on sending a greeting to individuals throughout the year. You really don’t need any excuse to send a “thinking of you” note. To get started, grab a shoe-box, a favorite pen, a book of stamps, and some blank note cards. Have them altogether so when you get the impulse to write, it’s all there for you. So instead of stressing yourself out this holiday season, fighting the crowds looking for that special tchotchke for someone, try doing something more personal, like writing them a letter. Richard R. John, Spreading the News: The American Postal System from Franklin to Morse. Harvard University Press. 1998.